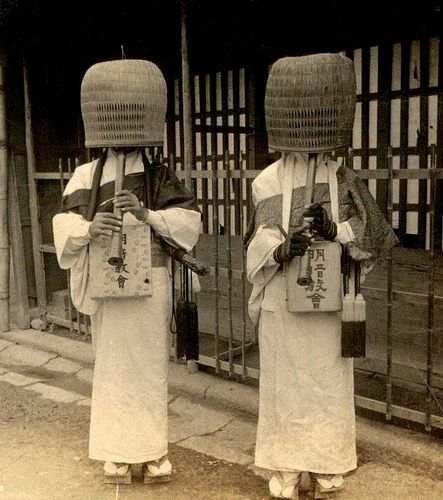 A pair of Japanese Komuso or “Monks of Emptiness.” Original Source: Unknown. I am currently in the middle of writing a short introduction that I was asked to contribute to a forthcoming volume. As such we will be revisiting a post from the archives which asks how secrecy, often criticized as the bane of the traditional martial arts, might actually be contributing to their flexibility and continued survival in the current era. Yet before moving on I have a brief announcement. It was recently brought to my attention that Kung Fu Tea was selected as one of the Top 30 Martial Arts Blogs by the travel site BookMartialArts.com. After taking a look at the rest of their blogroll that appears to be something of an accomplishment. There is a lot of good reading material on their list. And it is always exciting to see evidence of the growing popular interest in martial arts studies. It is hard to think of any topic that has more deeply marked the Chinese martial arts than secrecy. Countless students have been drawn to these systems by the search for mysterious techniques of revitalized health, self-actualization and combat prowess. Movies and novels have told stories of secret books, hidden temples and the rediscovery of long forgotten lore. Generations of reformers have railed against it, usually to little effect. In practical terms the traditional Chinese martial arts are an embodied practice in which one generation instructs the next through physical forms, drills and sparring. Hand combat can only be “understood” to the extent that it can be felt and experienced. Yet in the realm of media and popular culture these same systems are almost universally reimagined as the quest for hidden lore. These stories sometimes intersect with how the martial arts present themselves. Ancient secrets make for undeniably good advertising. Students may compete with each other to discover the greatest number of their master’s “secrets.” Adam Frank has recently observed that having a body of private knowledge may advantage certain instructors. Still, they cannot actually capitalize on this without revealing their “secrets.” Ergo the bilateral exchange of personal loyalty for information which is critical to the social structure of a number of martial arts communities. Even those teacher who boldly claim that “there are no secrets” or that “everything will be taught, holding nothing back” often find that it is impossible to check the rising demand for secrecy coming from their students. Ancient bodies of esoteric lore are so much a part of the image of the Chinese martial arts that even in instances in which reformers attempt to create more open structures, there is still a certain amount of cultural inertia opening a space for claim of “secret discipleship” and the like. It is not hard to understand why this subject has gotten under the skin of reformers and modernizers within the martial arts world since at least the 1910s. The more recent incarnations of these reformers might guess that the days of truly hidden lore are numbered. While claims about “lost lineages” within various styles continue to be published (and in truth there is a lot of martial culture that has remains stubbornly local in nature) hand combat students seem somewhat more jaded to such claims than they might have been in the past. In the era of both the internet and sentiments like “pictures or it didn’t happen,” is it truly possible for the martial arts to remain hidden behind a mysterious and poorly understood past? Many individuals suspect that the globalization of the Chinese martial arts will ultimately bring about the end of older ways of thinking about secrecy. 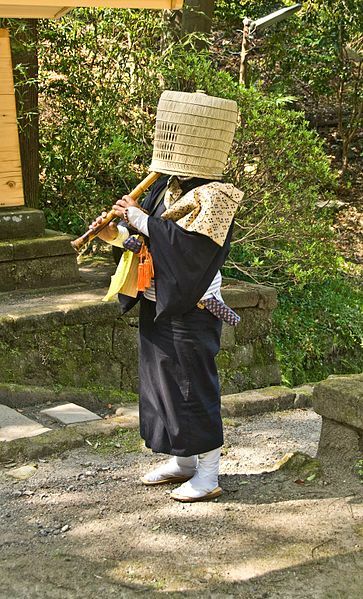 After all, the exchange of drabs of information for personal loyalty that underpinned this system may be much less fruitful when one’s students are actually consumers on the other side of the planet, all of whom can easily take up other arts (from various styles of Kung Fu, to MMA to Yoga) if they feel that they are being exploited. The basic reality of the Chinese martial arts is that they have always been, in large part, a form of commercial activity. Even in the “golden age” of 19th century clan feuds, martial arts instructors and mercenaries were hired from the outside and expected to be paid for their efforts in real money. In the current era, will open markets tolerate and continue to value secrecy? Surprisingly, the answer seems to be a resounding “yes.” As Adam Frank pointed out in a recent paper, it is not at all clear that the globalization of certain arts (in the case of his research Taijiquan) will lead to a universal liberalization of the practice. The opening of new markets and avenues of instruction has changed the personal calculus facing many individual instructors and their larger martial associations back in China. As always, it is difficult to monetize one’s mastery of the martial arts without being willing to teach the complete system to students who are able to pay for instruction. Yet the appearance of these new lucrative markets also gives organizations an incentive to tighten discipline and engage in internal competition over who has the “right” to teach the family’s secrets. Thus it may be that the commercial success of these arts in the current era actually reinforces their more esoteric tendencies. 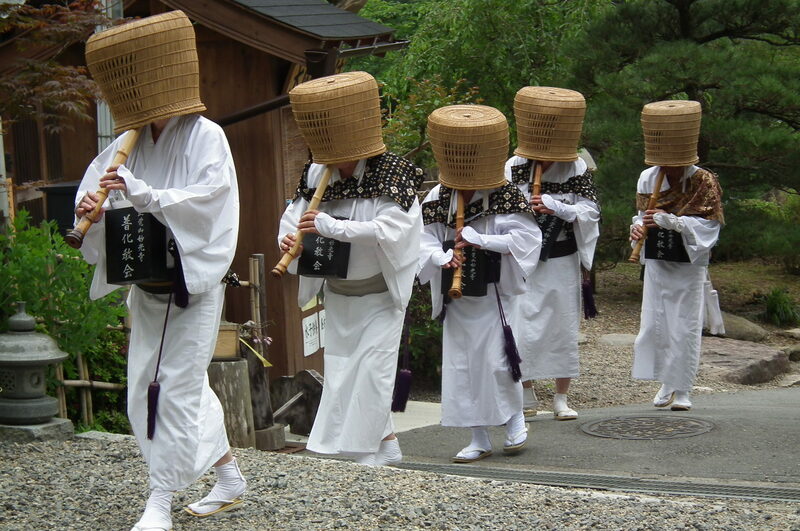 Daikokuji-Sasayama Komusō Shakuhachi. Photo by 松岡明芳. Source: Wikimedia. Over the last few years I have repeatedly found myself thinking about the many roles that secrets play within the martial arts. This is much too large a topic for a single post. Yet when I was reviewing Gary J. Krug’s article “At the Feet of the Master: Three Stages in the Appropriation of Okinawan Karate into Anglo-American Culture” I found that he actually had a number of things to contribute to this conversation. Readers will recall that in his paper Krug attempted to explain the complex process by which Karate came to be accepted as a normal (and unthreatening) part of American commercial life a few decades after the conclusion of a destructive war with Japan. Krug argued that Karate was too complex a cultural phenomenon to be adopted all at once, or without substantial transformation. Its “appropriation” by western society could only be completed once a substantial body of other more basic ideas which underpinned the practice of Karate (chief among them Traditional Chinese Medicine) came to be accepted in the West. Yet rather than engaging in a true discourse with the culturally bounded concepts that lay behind Okinawan karate, this process allowed the West to detach it from its original matrix and to claim it as an indigenous product. Krug’s argument is not without its problems. As I argued last time, the strength of his paper lays in the fact that he is advancing a more general theory of how complex acts of cultural appropriation happen which has application far beyond the rather limited case of Karate. Yet his key independent variable is exogenous to his model (meaning that the most important factors in his theory are simply “assumed” rather than explained) and his treatment of certain ideas, like TCM, tends to be rather reductive. After posting this critique Paul Bowman sent me a link to another article that also examined the origins of Karate, suggesting that it might be useful when thinking about Krug. “Constructing a Martial Tradition: Rethinking a Popular History of Karate-Dou” by Kevin S. Y. Tan (Journal of Sport & Social Issues, 28:2 (May) 2004 pp 169-192) makes many contributions to this discussion and anyone studying Krug will also want to read his paper. Tan’s critique of Karate’s treatment within popular culture picks up on many of the same themes that Krug touched on, yet its implications tend to be further reaching. Like Krug, much of Tan’s theoretical framework is also directly applicable to the very similar discussions that are often seen on the origins of influences within the various styles of the Chinese martial arts. Perhaps the most refreshing aspect of Tan’s paper is his suggestion that both practicing students and historians of the martial arts become much more comfortable with three short words, “we don’t know.” He notes that both groups often seek to speak to the various national, social and cultural factors that influenced the development of martial arts traditions such as Karate. While Krug’s paper really focused on the post-1946 era, Tan instead attempted to assess what we can assert with certainty about the deeper history of this art going back to the 17th century. What he found was that very little could be documented with any degree of certainty. Worse yet, the basic concepts that we often attempt to impose on these sorts of conversations (like what it means to assert that Karate is an “Okinawan” or a “Japanese” art) are in many ways deeply anachronistic. Some of these ideas are actually the product of multiple layers of complex and strategic mythmaking which unfolded slowly as Okinawa, China, Japan and America played out themes of dependency, colonization, national awakening and imperialism. Yes it is “correct” that say that Karate is an Okinawan art, yet that seemingly simple assertion obscures huge amounts of intricate social history that is critical for understanding how it (or any other traditional fighting system) actually emerged in the modern era. It is interesting to note that Tan’s paper does not directly engage Krug, even though one possible reading of his conclusion would seem to problematize much of his predecessor’s argument. One cannot really fault Anglo-Americans for innovating in their practice of the art after arguing in painstaking detail that the entire idea of “traditional Japanese Karate” is basically a simulacra, a detailed representation of a past that never really happened that way. At the very least, it was understood in vastly different ways by the individuals who were actually engaged in its practice than how we tend to imagine their efforts today. The one time that Tan does directly engage with Krug is in his discussion of the post-WWII evolution of the art. Tan notes that Krug perceives Karate as having been dissociated from its Okinawan and Japanese roots through the process of western cultural appropriation. While seeming to leave the door open for such a possibility in the future, Tan’s interpretation of the situation in the West is fairly different. Rather than Karate being “westernized,” he sees it as remaining primarily a projection of oriental and “Japanese” (rather than Okinawan) identity. Likewise Tan’s exploration of Karate’s importation into Japan seems to undercut Krug’s assertion that the cultural similarities between these two places simplified the process and allowed for “cross-fertilization” rather than “appropriation” (as was necessary in the more alien West). In fact there was nothing simple about this short voyage and the end result as described by Tan actually bears a striking resemblance to exactly the sorts of “appropriation” and aggressive adaptation that Krug outlined. Given these empirical discrepancies we might be tempted to simply dismiss Krug’s treatment of Karate’s nature and thus much of the basis of his argument. Perhaps his tendency towards reductionism extends beyond his cursory treatment of TCM. Perhaps it encompasses Karate itself, his central object of study? A more generous reading of Krug’s article would suggest that we resist this temptation. In his opening sentences Krug defines Karate and as an “object of knowledge” and not a fixed body of techniques, practices or even identities. In his view what we now call Karate represents a complex dialogue of ever evolving concepts, philosophies, histories and calculations. In that sense he would seem to agree with Tan’s call for the rejection of “a rigid and linear understanding of the process of history making or any narrow claims to essentialized notions of culture.” Perhaps the biggest difference between the two authors is that Krug seems to place more emphasis on the unfolding conversation happening on the island of Okinawa itself while Tan’s more systemic approach takes all of the Pacific Rim as the relevant unit of analysis. Krug might respond that the seeming crystallization of Karate that readers may detect in his article is more of a product of how it was being treated in Anglo-American culture in the 1950s and 1960s than his own understanding of his object of study. He notes that as American GI’s came into contact with the art it became a frozen moment in their imagination. What had initially been a single instant in an ongoing conversation about hand combat, local culture and colonization became a touchstone for how generations of Americans would imagine what it meant to be “Japanese.” In reality the conversation continued to evolve in schools across Okinawa and Japan…but not in the minds of this new generation of western students. The similarities and differences between Tan’s argument and Krug’s theory of cultural appropriation make the two interesting debating partners. The papers share enough common ground that one can sustain a conversation between the authors. Tan provides a much more detailed and accurate picture of the early emergence of Karate, while Krug’s interests are restricted to its evolution within in western markets. While Tan is probably writing better social history, I have to admit that I find of number of the ideas that Krug raises to be fascinating and potentially helpful. Another Komuso Buddhist Monk. Photo by Tarourashima. Source: Wikimedia. From time to time it becomes necessary to explain why otherwise sober scholars would spend valuable resources studying a “pop” phenomenon such as Karate, or the Chinese martial arts. It is all too easy to argue, as both Tan and Krug (among many others) do, that these things have functioned primarily as a signifier of western beliefs about the nature of Asian identity. Yet that alone does not make them theoretically interesting. Nor does it actually explain the success of the martial arts in the West. Many things, from “Willow Ware” porcelain to pictures of Chinese women with bound feet, have served as potent markers of the “Oriental Other” in the western imagination. Most of these signifiers have faded and been replaced over time. I suspect that more Americans probably associate the drinking of Tea with the United Kingdom today than they do with China. Yet this surely would not have been the case in the 18th or 19th century. The martial arts have shown a remarkable degree of cultural resilience. First discussed in print and taught in the west from about 1900 onwards, these practices have gained both cultural value and market share over time. Theorists can even point to specific periods (one after 1945 and another in the 1970s) when the meaning of these practices shifted in dramatic ways, allowing them to grow in popularity. Nor has this process been restricted to the West. While early 20th century modernizers predicted the imminent demise of the martial arts (especially in China), these movements have demonstrated a surprising ability to reinvent themselves in practically every generation. They have adapted both their techniques and institutional forms to match the unique market conditions that modernity and globalization have created. While the martial arts maintain the public image of timeless and stoic tradition, holding up their hands against the onslaught of social change, they are in fact unmistakably modern practices. The economic and social conditions that even the most traditional hand combat schools depends upon for their daily survival (such as the existence of a monetized market economy) guarantee this. This image of cultural continuity is one of the “goods” that modern consumers demand. Yet it is supplied by organizations and movements that are in a constant state of revival, reimagining both themselves and their relationship with the past. This is the basic pattern that both Krug and Tan see in the history of Karate. Nor is it all that different from what exists in the other martial arts. How do they pull it off? How do the various hand combat schools create a deep sense of continuity with the past while at the same time appealing to the ever evolving demands of consumers? At the beginning of this blog post I mentioned the role of globalization, cheap video and the internet in the evolution of the martial arts. All of this has conspired to put more information in the hands of martial arts students than they ever possessed in the past. The dominant discourse that surrounds many of the traditional arts has also conditioned these individuals to be on the lookout for all sorts of “secrets.” One simply has to visit any internet chatroom dedicated to the martial arts to find some exquisitely detailed debates on arcane lineages or hidden techniques. All of this has sensitized certain individuals (particularly those interested in a more critical approach to martial arts history) to the frequent claims of the rediscovery of lost lineages, techniques, books or even entire arts. Other claims are more modest. We also see individuals attempting to really research their own forms in an effort to find new applications, better ways of dealing grappling than their instructors may have taught, or critical insights to empower a renewed emphasis on contact weapons training. It seems that no matter who you are, the discovery of new information is a critical aspect of the lived experience of the martial arts. When considering the remarkable flexibility and survival of these fighting systems, Krug argued that we should view the seemingly impenetrable, always shifting, bamboo curtain that obscures so many aspects of the “real history” of the martial arts as a feature of this system rather than as a bug. It is this belief that there is always something more to be revealed, something just a little wiser, more deadly, or more culturally relevant, that keeps students coming back for more. More crassly, it is the seemingly unending faith that we have in the ancient masters that provides our modern teachers with the breathing room and the license that they need to keep these arts socially relevant and institutionally vital. Krug found that the idea of secrecy itself was vital to Karate’s success in West, a civilization that claims to value transparency as a central value. Tan’s social history of hand combat in Okinawa, and its encounter with Japan, provides a number of places where these same mechanisms can be observed. Yet when it comes to secrecy the Chinese martial arts are second to none. Is traditional Kung Fu really on its deathbed? Not as long as it can maintain the allure of its mysteries. These show no signs of fading. If you enjoyed this you might also want to see: “Fighting Styles” or “Martial Brands”? An economic approach to understanding “lost lineages” in the Chinese Martial Arts. I think it’s interesting to note that the ‘secrecy’ of martial arts may continue to be revitalized in America because of the developmental qualities that martial arts can have on a person. America has continued in a way of ill health for decades and now we are at a point that almost everyone has an aliment of some sort, they are malnourished in the midst of plenty, and therefore severely under developed, not only physically, but mentally and spiritually. So, it is absolutely a ‘secret’ to most all Americans today to know what its like to be a healthy developed human being- something we often associate with Asians, in particular ancient masters, TCM, etc. In their quest to regain their health and find what they are missing, the rich history of martial arts provides a world of possibilities and solutions.